Based in St. Louis, Missouri (USA), Circus Flora was originally commissioned by Gian Carlo Menotti for the 1986 Spoleto Festival USA, and produced by Ivor David Balding (1939-2014). A classic one-ring circus with a theatrical touch, it met with an overwhelmingly positive response—at a time when this type of circus show was still a rarity in the U.S. Together with Sheila and Sam Jewell and Alexandre Sacha Pavlata, Ivor David Balding established Circus Flora in 1987 as a permanent performing arts organization in St. Louis. 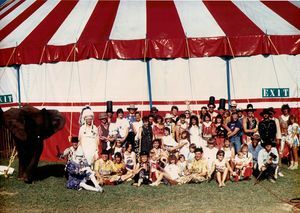 Established as a theater company, Circus Flora was organized at the outset as an ensemble, one-ring circus, and performs in a big topThe circus tent. America: The main tent of a traveling circus, where the show is performed, as opposed to the other tops. (French, Russian: Chapiteau) tent. This new performing arts organization set out to acquaint American audiences with the joy and power of the classic, European-style circus. The circus was named after Flora, an orphaned elephant that Balding had rescued when ivory poachers in Africa killed her mother. For fifteen years, Flora was a beloved star of the circus that bears her name. In 2000, she retired in the elephant sanctuary in Hohenwald, Tennessee. Circus Flora was a hit from the very beginning. Not content with a traditional succession of circus acts, Balding set out to create an original formula—weaving separate acts together by the common thread of an engaging storyline, in the manner of traditional circus pantomimes. A specificity of Balding’s formula was that the story could continue from one season to another, like old film serials. From 1987 to 1994, Circus Flora told the saga of the Baldini family (with David Balding playing its patriarch, Signor Baldini), an imaginary Italian family of circus performers immigrating to the United States. The first installment in 1987 didn’t have a title, but the subsequent chapters had: The Journey West (1988); Back to the Bayou (1989); Back to the Bayou, Part II (1990); Pirates (1991); Pirates, Part II (1992); California: The Journey’s End (1993); California, The Journey’s End, Part II (1994). The ensemble company mixes world-class, family-based circus knowledge, passed down from generation to generation, with actors, dancers, musicians, as well as performers from the new circus and new vaudeville movements. Circus Flora also insists on using original, live music and animal acts—notably equestrian acts, which are historically at the core of circus arts. Year after year, Circus Flora’s momentum has continued to grow. Although Circus Flora has a short season, its following is important, and its attendance has increased significantly over the years. It has also expanded its territory from St. Louis, Missouri, and the Spoleto Festival in Charlestown, South Carolina (where it has appeared six times), to Nantucket, Massachusetts. In 1997, Circus Flora’s big topThe circus tent. America: The main tent of a traveling circus, where the show is performed, as opposed to the other tops. (French, Russian: Chapiteau) was the first ever to be erected at the Kennedy Center in Washington, D.C.; and in 2002, the tent was raised at The Lincoln Center Festival in New York City. In December 2012, Ivor David Balding announced his intention to step down as Artistic Director of Circus Flora. 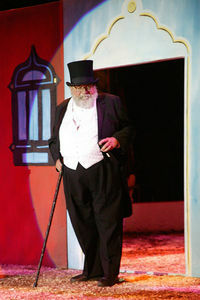 Jack Marsh, the son of Circus Flora's veteran performer and celebrated show narrator Cecil MacKinnon, was made Associate Artistic Director, a position he held until he succeeded to Balding in 2014.